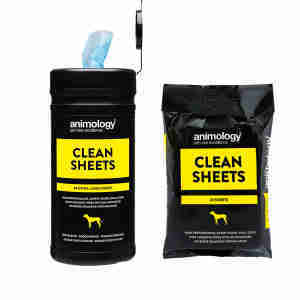 Animology Clean Sheets are high performance, extra-large and super tough cleaning wipes that helps keep your pet cleaner and fresher for longer. The Vitamin E helps protect and strengthen your pet’s hair. Super tough fabric– helps prevent tearing and avoids bits of wipe breaking off and getting tangles in the pet’s coat. Vitamin enriched – enriched with Vitamin E which is a powerful natural antioxidant that helps to protect and strengthen hair, improving the overall quality of a pet’s coat. Coat conditioning – contains a built in coat conditioner to add shine and lustre to a pets coat. Dual sided– the rough side helps loosen dirt and grime from the coat and the smooth side wipes away the dirt and can be used on delicate areas. Extra-large– approximately 20cm x 27cm, each wipe allows you to clean your pet without the mess ending up on your hands. Degreasing– contains an active no-rinse formulation that cuts through grease and ‘sticky stuff’ including fox poo! Deodorising– general dog odour will be kept to a minimum.